Critics of President Donald Trump argue that his personal and economic ties to both Saudi Arabia and Russia are allowing him to put America up for sale from his role as President. A look at his history with both countries shows his long-established financial relationship with Saudi Arabia is exceptionally friendly and has continued beyond his inauguration, while his affection towards and defense of Russia and President Vladimir Putin may partially stem from concern for further damage to his reputation. The CIA has reportedly concluded that Jamal Khashoggi, a Saudi Arabian citizen living in America, was assassinated by order of the Saudi Crown Prince. Mounting evidence indicates a team of at least 15 men detained Khashoggi shortly after he arrived at the Saudi consulate in Istanbul, and that he was overpowered, murdered, dismembered and disposed of before a look-alike was dressed in his clothes to make it appear that he left the building. The Turkish government provided to the CIA audio of the murder recorded from inside the consulate, as well as an intercepted phone call to the Crown Prince to confirm the assassination had been a success. This plot was allegedly concocted because Khashoggi was highly critical of the Saudi Arabian government, including as a journalist for the Washington Post. In spite of public outrage over the Saudi government’s seeming involvement in the murder of one of their citizens, Trump has yielded to denials from the Crown Prince and asserted that the American government has not made any conclusions on the matter. While promising a full report on “the overall impact” of Khashoggi’s death, Trump has still insisted that too many questions remain unanswered for intelligence agencies to definitively proclaim who was responsible for the murder. These statements put Trump in direct opposition of intelligence assessments by U.S. and European governments. Trump’s passivity on this issue has led to an inspection of his history with Saudi Arabia, dating back to the ’90s when a member of the Saudi royal family bought a yacht for $20 million and acted with a group to buy the Plaza Hotel for $325 million from Trump. In 2001, according to the New York Daily News, the Saudi government paid $4.5 million to buy a floor of the Trump World Tower in New York. While filing foreign lobbying paperwork with the Justice Department in 2017, a global public relations firm disclosed payments to a Trump hotel by the Saudi government. An executive with the group reported that a subcontractor initially paid for rooms in the Trump International Hotel in D.C. to house lobbyists and consultants who had been hired by Saudi Arabia. They were there to oppose the Justice Against Sponsors of Terrorism Act which was written to allow lawsuits by American citizens against foreign governments for acts of terrorism. The Saudi government was in strong opposition of the law and reimbursed the subcontractor for the rooms, effectively paying over a quarter of a million dollars to the Trump hotel. Additionally, according to a letter obtained by the Washington Post, a manager of the Trump International Hotel in New York claimed one visit from the Saudi Crown Prince this year boosted quarterly hotel revenue for the first quarter by 13%. 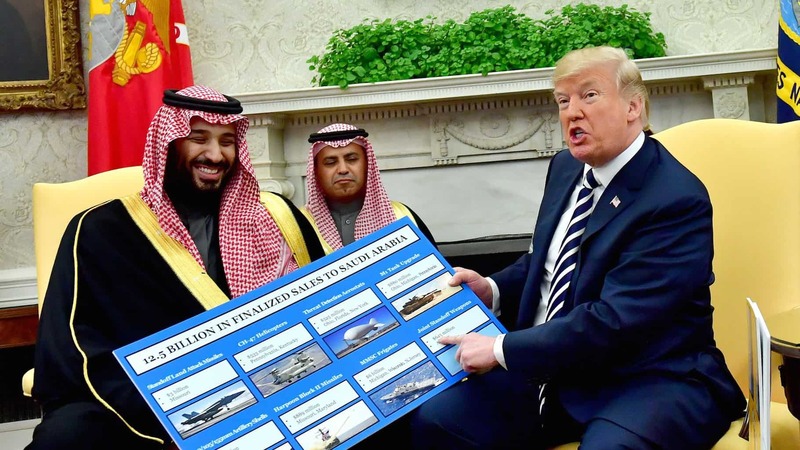 As President, Trump signed the largest arms deal in American history with Saudi Arabia in 2017, a deal which will be worth a reported $350 billion over ten years. The sale provided Saudi Arabia with American made tanks, ships, missiles, and other defense and security technologies, and Trump has cited it as another reason to stay friendly with the country. Human rights advocates argue the deal makes the US complicit to war crimes as Saudi Arabia has killed civilians in mass by intervening in the civil war in Yemen. A House Panel recently announced intentions to probe whether Trump has been influenced by his personal financial ties to Saudi Arabia in his role as President, including in his soft response to the murder of Khashoggi. Special counsel Robert Mueller has been investigating Russian interference in the 2016 American presidential election for almost a year and a half. In that time, guilty pleas to federal crimes have been secured from former Trump campaign policy adviser George Papadopoulos, former chair of the Trump campaign Paul Manafort, former Trump campaign aide Rick Gates, Trump’s former national security adviser Michael Flynn, and Trump’s former attorney Michael Cohen. While these associates were not charged with crimes relating to Russian interference, four did plead guilty to other crimes including making false statements regarding suspicious Russian contacts. Michael Cohen claimed that Trump was aware of a meeting that was to take place in Trump Tower between the Trump campaign and Russian agents who were offering information about Hillary Clinton and the Democratic Party. Trump has strongly rebuffed claims that he knew of the meeting, insisting to the New York Times that it must have been “a very unimportant meeting because I never even heard about it”. While continuing to call the investigation a witch hunt, Trump has also claimed that collusion is not a crime while also maintaining there was no collusion involving his campaign. The Trump family has an interesting history of financial relationships with Russia. According to New York Magazine, buyers connected to Russia used shell companies to make payments of $109 million cash for Trump properties between 2003 and 2017. Donald Trump Jr. was quoted in 2008 as saying Russians provided them with a “disproportionate cross-section of a lot of our assets”, and Eric Trump said in 2014 that the family did not rely on American banks because they received all the money they needed from Russia. In 2016, the head of a U.K. intelligence agency briefed CIA director at the time, John Brennan, on intercepted communications between Trump’s campaign and Russia. Brennan later went on to say he believes that Trump is afraid of Putin and that Putin holds information that would be damaging to Trump. The 2017 release of the Steele dossier created allegations that Trump paid prostitutes to urinate on a bed previously slept in by Barack Obama in a Moscow hotel room bugged by Russian intelligence. It has been speculated Putin has access to a tape of Trump’s activities in that room, and if such a tape exists, the President could arguably be heavily influenced by a desire to keep it from becoming public. Critics find it suspicious that Trump has deflected criticism of Putin regarding his involvement in the murders of Russian citizens, violations of human rights, and interference in the US presidential election, among many other disturbing accusations. In a meeting in Helsinki, Trump refused to use a script and chose to meet Putin alone with no aides present to record what was being said. Some perceived this as diplomatic friendliness, others as an indication of the power Putin has over Trump through either loyalty or blackmail. This only scratches the surface of the connections in these two relationships and more are expected to be revealed by Robert Mueller as he heads into the next stages of his investigation. With reports claiming Mueller has interest in Trump’s relations with Saudi Arabia as well as Russia, there will likely be more probing into if and how Trump has allowed America to become entangled by these two entities and if he did so knowingly to protect his own profit and interests.